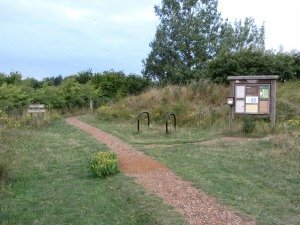 Ranworth Broad is actually a private broad owned by the Norfolk Wildlife Trust and the only way to reach it is by foot along a board walk or by one of the boat trips organised by the NWT. 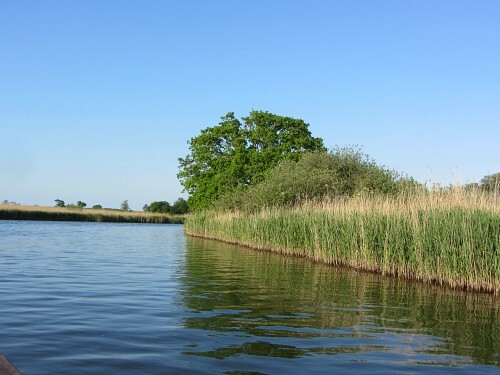 Keen to see and discover a part of the Broads that is not easily accessible, I chose the evening boat trip to St Benet’s Abbey and Ranworth Broad on one of those beautiful summer’s evening we sometimes have in the UK (just picked a good day!). 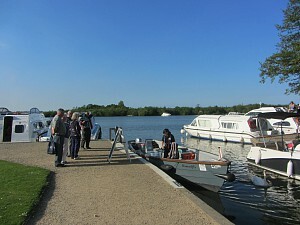 It turned out to be a really enjoyable and informative trip to see both the ruins of St Benet’s Abbey and Ranworth Broad with its floating visitor centre. 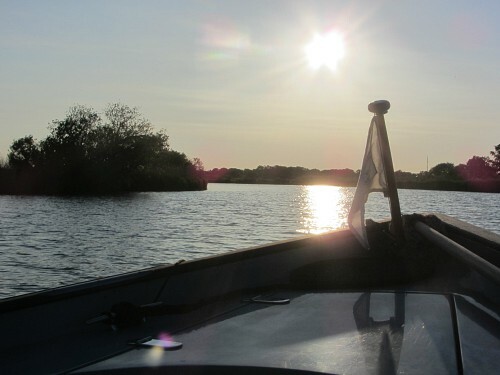 This evening trip is a wonderful way to while away a few relaxing hours and discover a little tiny chunk of what makes the Norfolk Broads so special. 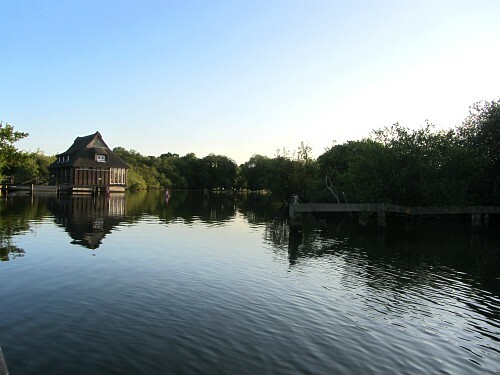 Norfolk Wildlife Trust’s Ranworth Broad is a private broad which you can only visit by foot or by taking their boat trips. You can’t access it any other way, even if you’re on a pleasure boat. You can either take a short boardwalk trail by foot from Malthouse Broad Staithe to the floating visitor centre, or enjoy a guided boat trip into the broad which is what I did. 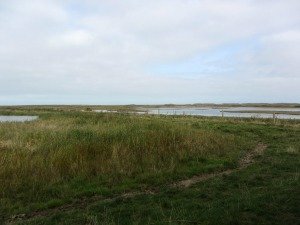 No other boats apart from those belonging to the Norfolk Wildlife Trust are allowed into this broad which makes it rather exclusive! The distinctive floating visitor centre with its thatched roof really is a spectacular site and crowned off the boat trip. To build this extraordinary centre, land had to be excavated and filled with concrete ballasts upon which the thatched visitor centre sits. 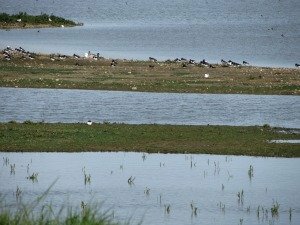 It has excellent views over the Broad, has a shop and light refreshments, and on the second floor has a viewing platform where you can spot the breeding terns and watch the cormorants, crested grebes etc. 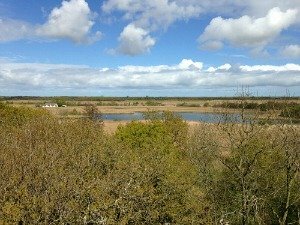 Like many of these Norfolk nature reserves, this particular one is of national and international importance for wildlife. 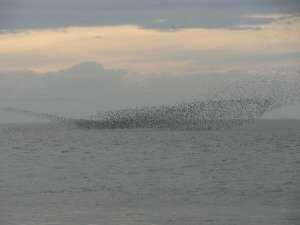 It has one of the largest cormorant roosts in the UK, and believe me, they were plentiful as we motored into the broad as the evening sun was setting. 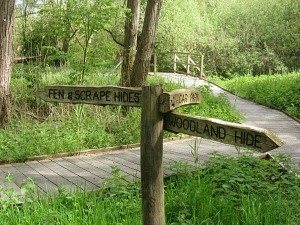 You can find out more about Norfolk Wildlife Trust Ranworth Broad here. 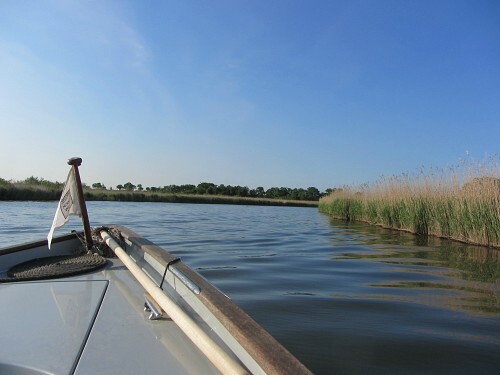 Norfolk Wildlife Trust have wonderful and varied wildlife water trails in the Broads which you can take between May to September (one of the other Broads boat trips is at Hickling Broad). 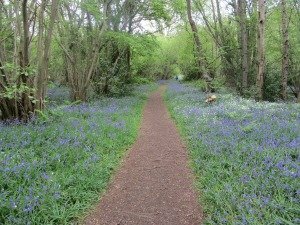 You can go on a Chorus Water Trail in May, Cockshoot Broad Water Trails on Sundays in July and August and finally the Evening Water Trails to St Benets Abbey on Thursdays from May to August. 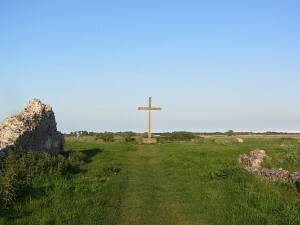 The boat trip with the additional stop to St Benet’s Abbey just brings in another enjoyable aspect to this trail. Starting off at Malthouse Staithe, the very knowledgeable and friendly guide sets you up with your lifejacket and gives the obligatory safety talk, and then you’re on your way out of the picturesque Staithe along the river. This was a very different start to the trip than the Hickling Broad boat trip as you sail along a river banked by trees rather than reed beds – that was to follow. Crested Grebes were plentiful which was lovely to see, and many swimming so close to the boat too. After a peaceful 10-15 minutes or so, with the electric engine on the boat fairly quiet and being given lots of very interesting information on the background of the Broads as well as how the Norfolk Wildlife Trust are helping to protect this area, you then reach the larger River Bure which is used much more for pleasure boats. One of the difference between this trip and the Hickling Broad boat trip is that this Broad is much more widely used by river boats and so there is usually more activity. However, having said that, this evening trip really is most peaceful for one reason; the pleasure boats need to be moored up by 5pm if they want to be assured of a place to stay that night!! 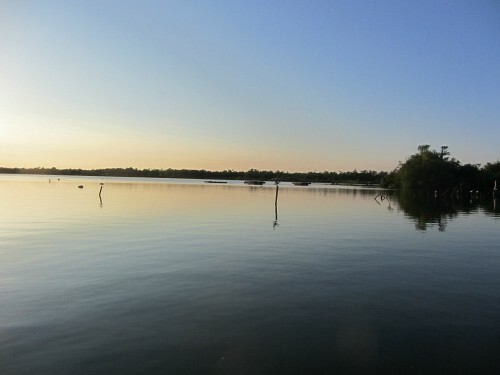 And the evening trip starts at 6pm, so it really does give you the chance to have the rivers almost to yourselves and to enjoy the tranquillity of this wonderful network of Broadland rivers. 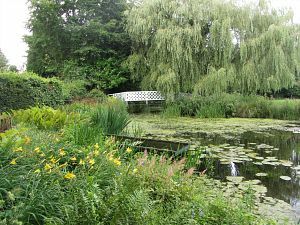 Once onto the River Bure, you're then amongst the reed beds, willow trees and oak trees, and of course, peace! Just the sound of lapping water on the bow of the boat. Hopefully you'll spot Marsh Harriers flying over you, catch sight of reed buntings and your lovely guide will point out things like the water lilies on the side of the river, as well as the “goose line” in the reeds which I certainly wouldn’t have known about without our NWT guide. 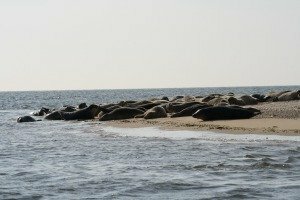 You’ll find out more about these facts on a Norfolk Wildlife Boat Trip! 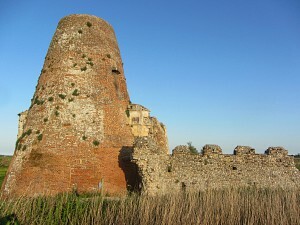 Finally we saw St Benet’s Abbey in the distance. We duly moored and then had time to wander around the ruins of the Abbey. 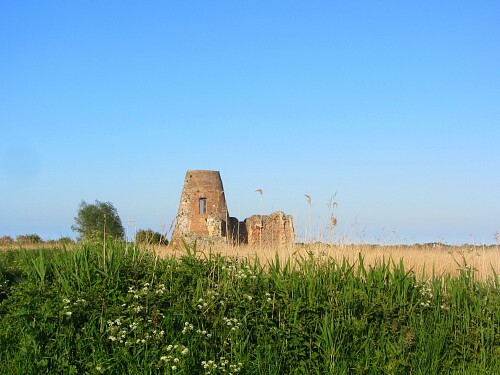 This is a fantastic chance to see St Benet's Abbey, as well as getting the chance to see some wildlife on the Broad– so in effect, with this trip, you'll be getting two for one! 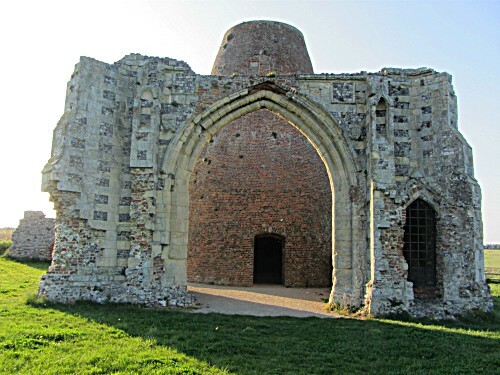 Now owned by the Norfolk Archaeological Trust, St Benet’s Abbey was the only monastery not to be dissolved by Henry VIII, which makes it pretty special. Although it wasn’t dissolved, the Abbot was then made Bishop of Norwich but on condition that he gave properties to the Crown. Even today, the Bishop of Norwich is still connected to the Abbey and every year, on the first Sunday in August, he conducts an open-air service. The only structure left of the Abbey is the gatehouse which bizarrely has a mill right in the middle of it, nothing whatsoever to do with the Abbey, and makes it all the more unusual. The mill was built in the 1720's to crush oil seed, and they used the gatehouse as a support for the mill. 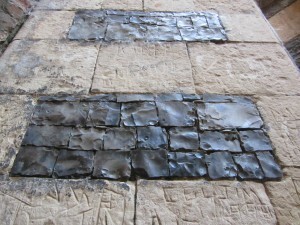 The information boards on the site also give you a really good idea of what it would have been like back in medieval times. 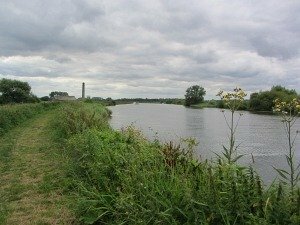 A bit like Ranworth Broad, the only way to reach St Benet’s Abbey is by river or by walking, which makes it all the more mysterious and atmospheric. 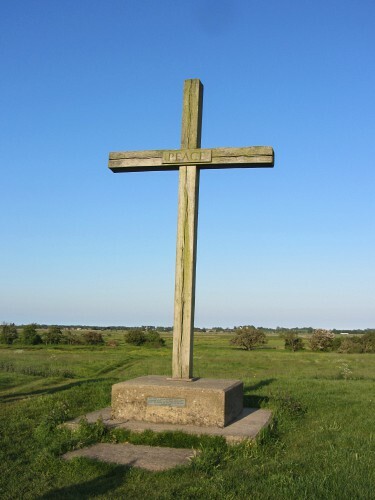 It’s set on a slight hill which gives excellent views over the Broadland landscape and is well worth a visit. Resplendent on the sky line is the large wooden oak cross which was commissioned in 1987 from the Sandringham Estate and is placed where the high alter of the Abbey would have been. We have various places you can stay in the Norfolk Broads. The Boathouse at Ormesby Broad is set in a fantastic location on the quiet Broad and just away from the busier towns. Stunning views over the Broad from the bar, rooms and gardens. 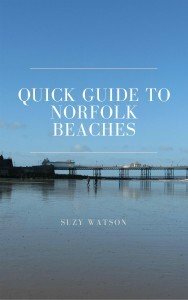 Or more from Pack Holidays on our Norfolk Cottages page. Having had a relaxing wander around the ruins, you're then taken back into the boat and head off into the sunset (hopefully!) and to Ranworth Broad. You sail quietly around the broad, spot the copious amounts of cormorants coming in to roost, see the terns nesting on the purpose built rafts and crested grebe all over the water. But most spectacular for me, was the sight of the visitor centre in the setting sun. It’s 40 years old with a thatched roof and just looks as if it totally belongs there. 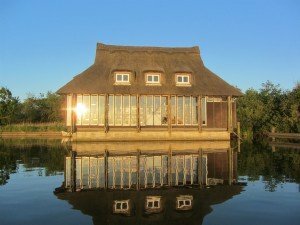 It was a very special boat trip, I loved every moment of it, it was interesting, enlightening and a wonderful way to spend an evening on the Broads. 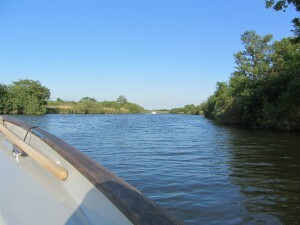 The boat trips on Ranworth Broad run from May to September with varying trips and lengths of trips. 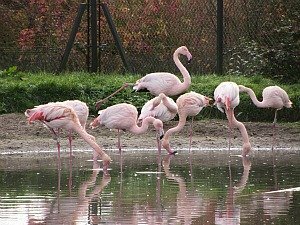 For more details about these, please visit the NWT Ranworth Broad website here. 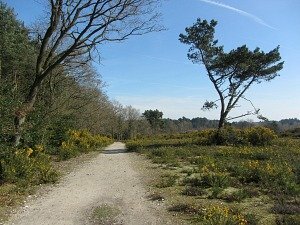 Or for more details on Ranworth Broad and the Norfolk Wildlife Trust, click here.